When the Friday September 2, 2001 The Vancouver Courier crashed on my front door (I invariably get it one day late where I live) I was intrigued by the cover (article called Overtime Heroes by Andrew Fleming) because the woman on the right was familiar to me. I noticed that her surname had a French accent. I was not familiar with that. As soon as I looked up Dubé, Danielle in my files it all came back instantly. The story of Danielle Dube (minus that accent) in my files began began in 1988 when every attempt of filing an envelope on which I had written very young hockey goalie got me nowhere. I did not throw the envelope away but placed it in a box with other of my filing miscreants. In February 1997 I received a phone call from an editor at the Georgia Straight assigning me to photograph a female hockey goalie who was headed to the Olympic team. Perhaps in those days the Straight (I think I remember this) had style book that ignored most foreign accents and stuff in Spanish like pingüino or año. 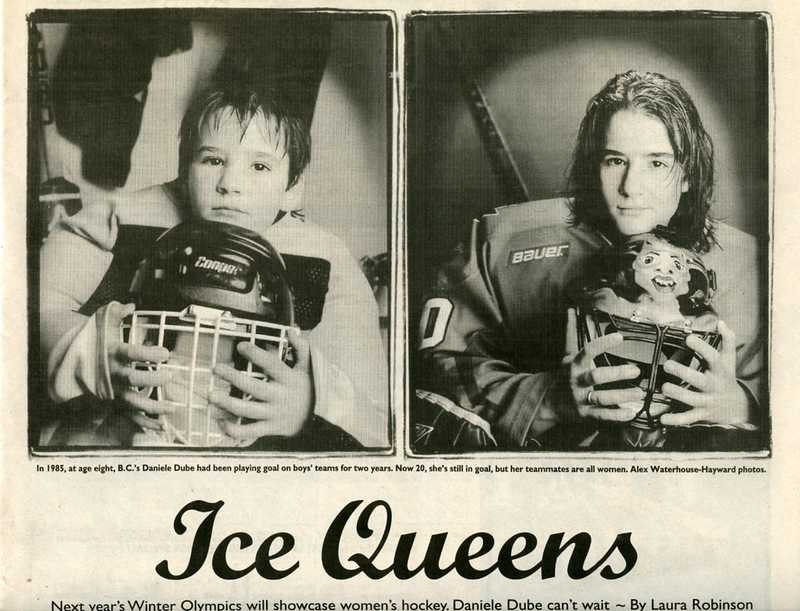 But the Straight’s Dube was my young hockey goalie whom I had photographed in 1985 and the Dubé in my Saturday Courier. This incident in my mind is one of the supreme pleasures of photography. It is the pleasure of taking someone’s picture more that once (I had that with Arthur Erickson) and being able to see how time not only affects my subjects but also how I perceive them. In this age of instantaneous everything I am almost sure that the Courier photographer, (the cover was not credited to Courier photographer Dan Toulgoet) had no access to a manuscript or copy of the soon to be published article. He had no way of pre-conceiving his photo session with Dubé. In my years in the stone age of magazine and Straight photography in Vancouver I was always given copy to read. I then did what until recently was one of the charms of good journalism which is the hand in hand relationship between copy and illustrating image. As a photographer I reasearched my subject and called the writer to get impressions. In most cases I was faxe the copy. Now photographers and illustrators go their separate ways from writers and shoot cold turkey. This trend is also dangerously moving into the writers themselves who might do phone or email interviews with people who live in the very same city they are reporting on. For the March 20 to 27, 1997 Georgia Straight article Ice Queens by Laura Robinson I was able to convince the editor at the possibility of running both pictures of Dube, the one I had taken years before and a contemporary one. I had the idea of using the same camera, same lens, same film with the change of hockey equipment and Dube’s age as the only differences. I took that other picture od Dube, all dolled up in the slinky dress but I am not sure if there was any room for it. Here it is. For the picture of Dube in the slinky dress I used a projecting optical spotlight to mimic the goal’s netting. I used a grid spotlight on Dube’s face to make her look even more glamorous and mysterious.